What a fantastic songwriter he was.A legend whose work carries on today...played by musicians all over the world.Talk about an influence.....here's the artist! !....Nobody like him! !....What a gift to music lovers everywhere!! An almost forgotten artist whose short, troubled life was full of brilliant music. Great new addition. Thank you! Yeah, maybe in some circles, but around Austin his music gets a lot of play. And he's been covered by everybody and their dog. Now you talk about almost forgotten, Blaze Foley was another incredible talent with a penchant for self-destruction. Even Townes would tell Blaze 'Man, you have got to slow down'. Ethan Hawke recently made a biopic about him. Regardless, glad you're diggin' it! Thanks for playing this. 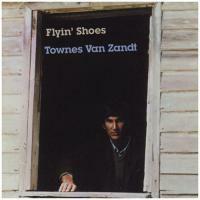 Although I knew it was written by Townes Van Zandt, I had only heard Lyle Lovett's version. The man sure knew how to write a sad song. The roman God Mercury had Flying shoes.....look where they got him. He had a cool hat too. This is about as honest and vulnerable of a recording as you can get. Well, he flitted around from place to place, but I can't think of anything bad happening to him. You're not referring to Icarus, are you? You keep Bill's coffee table in your boots - and you're able to stand on it as well?!! More Townes please. And I will stand on Bill g's coffee table in my boots to make it happen! What a simple, elegant, deeply felt tune. Very moving. Hard to get away from Lyle's version when I listen to this.